2018 was a strong year for documentaries. Standout titles included Won’t You Be My Neighbor?, Three Identical Strangers, Free Solo and Hale County, This Morning This Evening — none of which I saw, unfortunately. But I did watch one of the most powerful, moving docs I’ve ever seen — Bing Liu’s Minding the Gap. If you haven’t seen this film, do yourself a favor and stop reading the blog and go watch it! It’s on Hulu, for God’s sake. Hell, if you don’t have Hulu, I’ll give you my password. Minding the Gap, which follows a group of skateboarder friends in Rockford, Illinois, for a decade or so, is at turns beautiful, haunting and hopeful. It’s a cinematic Trojan Horse, starting off as a skateboarding Hoop Dreams but transforming into a powerful treatise on the cycle of familial violence. Director Bing Liu, an avid skater himself, says the idea for the film came to him years ago when he was skating with a group of friends and realized it was Father’s Day. None of them had a good enough relationship with their fathers to have reason to be anywhere else. He wondered what it was about this sport that drew so many neglected young men. Minding the Gap explores that question, and hints at an answer in its extraordinary ground-level cinematography, shot by Liu himself, which gives viewers a glimpse of the existential release offered by four wheels and a board. But it goes so much deeper, into the lives and relationships of its central characters. I hesitate to say any more, because the film is full of small surprises that change the way we think about everybody in it. This is a work of startling empathy and maturity. Please don’t miss it. OK, I get it. I’ve listed seven movies that are variations of powerful and important, heartbreaking and groundbreaking, and now here we are at #3 — a cheesy musical sequel. Something does not compute! I can defend my love of Mamma Mia! Here We Go Again on a strictly cinematic level. It is extremely well-cast and well-acted, down to the smallest roles. Director Ol Parker stages the music numbers with charm and wit. The film is so well-paced, I defy you to jump on at any point and not stay until the end. The script delivers big laughs and quite a few tears. The lesser-known ABBA songs are better than the lineup from the original film. And in Lily James’ lead performance, you have the rare treat of watching an actor become a star before your eyes. As the kids today would put it, she’s iconic in this role. All of that is true, and warrants this film’s presence on my top ten list. But all of that aside, I have it where I do because I just love it. Without shame, without apology. I remember watching it the first time, somewhat reluctantly, and realizing as it went on that I was completely falling for it. I took my daughters to see it a second time a week or two later, and loved it all the more for giving me that experience. I’ve treasured every repeat viewing since (and there have been more than I care to reveal). How can a movie that makes me that happy not be one of the best of the year? This entry was posted in song of the day and tagged Chris Spedding, Mamma Mia! Here We Go Again, Minding the Gap, Video Life. I’ve teased you enough about your over the top adoration/obsession of Mamma Mia 2, so I’ll refrain here. You are a fan of documentaries, though, so I think you’d be safe with Minding the Gap. I’m eager to see Minding the Gap and would encourage you to see Mid 90’s, as it shares many of the provocative themes you mention here. Jonah Hill’s film, equal parts funny and heartbreaking, never got the viewership it deserved despite receiving wonderful reviews. Meanwhile, Free Solo seems to out in IMAX theaters this weekend, and Maddie insists that’s the way to experience it. Hulu just won’t cut it for that one. While I would never diminish the charms and talent of Ms. James, it is too simple to say she is the only difference between the two films. 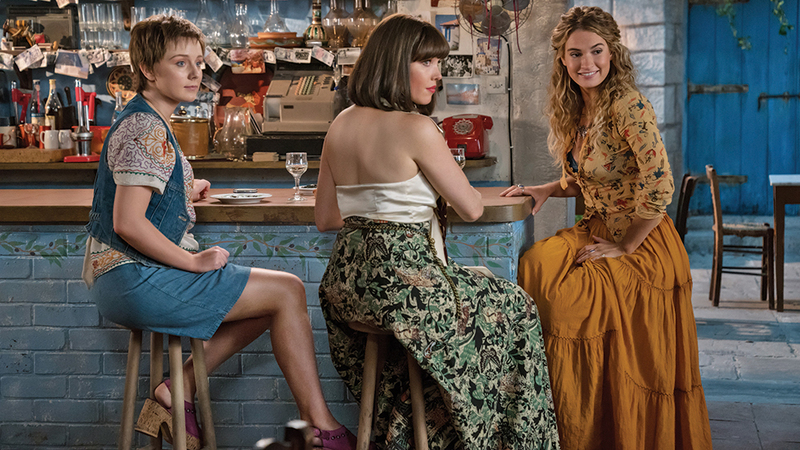 The first Mamma Mia is poorly shot and directed, and the songs run into each other like cars colliding in a traffic pileup. It teeters between goofily charming and just plain goofy. Streep is great, and the final 15 minutes or so are wonderful, but on the whole it’s a bit of a train wreck. Cool it with the Mamma Mia hate speech. Mamma Mia ran so Lily James could sway through orange trees. Returning this just to say that the first Mamma Mia was directed by a woman and that just makes so much sense with how much stronger the emotional impact of Slipping Through My Fingers and Dancing Queen was compared to any phoned in “Meryl Streep is Dead” stuff in Here We Go Again. And that’s the tea. I have only seen Won’t you be my Neighbor? And Three Identical Strangers and both were wonderful! Dana I plan to see Minding the Gap today and will report back! I’ll report back on Minding the Gap soon as well! Looking forward to watching it. I also had a great time with Here We Go Again, though it doesn’t hold a candle to the original for me because, while everything you said about it is true, it most truly captures the essence of Abba and brings the fun and tears in full force. That said, I’ll follow Lily James to whatever film she chooses.